(Newser) – California Gov. 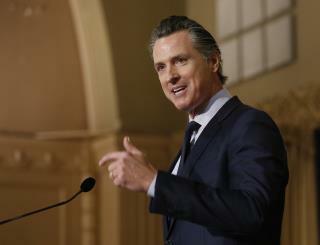 Gavin Newsom plans to withdraw several hundred National Guard troops Monday from the state's southern border with Mexico in defiance of the Trump administration's request for support from border states. About 100 of the 360 troops will remain deployed under California's agreement with the federal government to focus specifically on combating transnational crime such as drug and gun smuggling, Newsom spokesman Nathan Click says. Specifically, they will be tasked with providing intelligence on transnational crime and assist with cargo dock operations and searches of commercial trucks for contraband. Around 110 troops will be reassigned to beef up California's fire preparation efforts. Newsom's move comes on the heels of New Mexico Gov. Michelle Lujan Grisham, also a Democrat, pulling back her state's troops from the US-Mexico border. The former governors of the two states agreed to send troops to the border last April at the Trump administration's request along with Texas and Arizona, which still have troops at the border. Newsom's and Grisham's actions are a fresh, if symbolic, affront to President Trump's description of a crisis at the border, the AP reports. "The border 'emergency' is a manufactured crisis, and California will not be part of this political theater," Newsom plans to say in his Tuesday State of the State address, according to excerpts released by his office. What's wrong w/ this picture? First of all, CA has the longest stretch of continuous border fence of any border state - distance/percentage-wise. Over 90% 2) A state official cannot tell NATIONAL guard or national anything what to do. National/Federal supersedes anything state demanded, so the Gov of CA is in an illegal position (what else is new for libs?) and 3) the border does not belong to just California. It belongs to all of the United states. Cali cannot control 'their' portion of it as if they were a national entity. But they are trying and its illegal. The Good Book states that God gave them over to a reprobate mind, and He certainly did not exclude California governors. WHEW!! !